The Dog Escape Preventer is a very cool, innovative solution to keeping your dog inside while you greet your guests, or accept a delivery. It's a roll-up, retractable, vinyl barrier that you mount on the wall frame next to the door. Then you attach the door clips at the end of the roll to your door. When visitors come and you open the door, the door will open up to the 54 inches that the vinyl barrier extends. When you close the door, the barrier retracts. The barrier is 31 inches high, tear and puncture resistant. 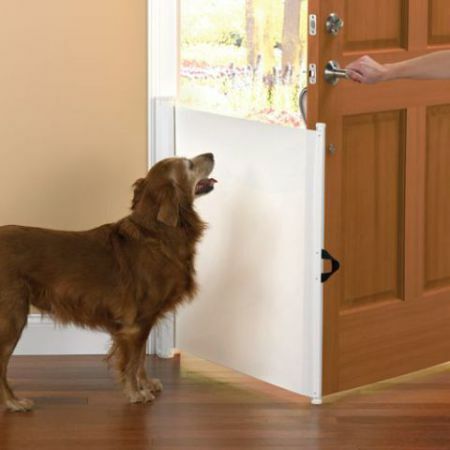 The idea behind the Dog Escape Preventer is that a solid barrier, as opposed to a gate, will make your dog lose interest in what's outside because he won't be able see it. I don't know about the psychology of the Dog Escape Preventer; I just like the fact that it will physically block the dog's escape! The Dog Escape Preventer is available from Hammacher Schlemmer, and comes with the store's lifetime guarantee.